First Priority came to us with an early social media presence, but they wanted to do a better job of building their brand on these social platforms, and then driving traffic to their website. 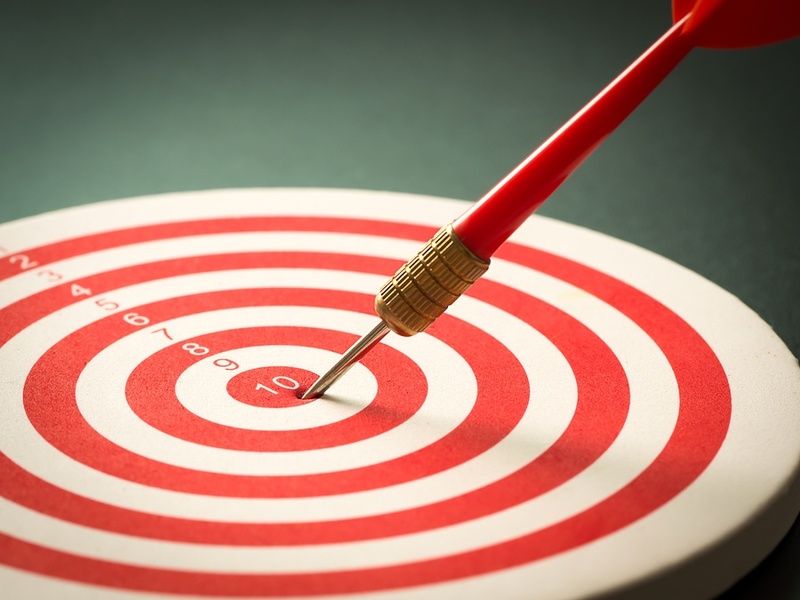 Their team was also interested in leveraging recent member survey data to better connect with members around specific products and services self-identified as a high priority over the next 12 months. Our 8-week package of training, strategy, content curation and marketing consulting was a good fit. This package is designed to empower internal staff with the know-how to move forward on their own. In our 8 week JumpStart package we spend the second four weeks of service we running Facebook ads for the client. First Priority had a small monthly ads budget to work with, but our results are still VERY strong. In just one month 5586 people liked, commented, shared or clicked on the content we shared for First Priority, and we were able to engage with confirmed members 1791 times! We also sent 282 people to revenue generating pages on the CU website during those weeks. 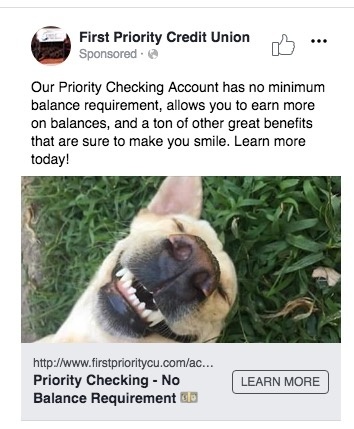 The cost per click (CPC) for these ads was only $0.94, which is well below average for financial services, and 58 confirmed CU members became Facebook fans. We reached over 32k people during the 4 week and grew their total Facebook fans from 339 to 480, and we accomplished all of this for only $478!! When Facebook ads are designed and targeted properly, a little can go a LONG way! For the first four weeks of our JumpStart package we work with the client to devise a custom social media and digital marketing strategy and optimize their social profiles. We also spend 6-8 hours on training calls, covering social media marketing best practice, and then can cover content marketing keyword strategy and SEO tips, Twitter or Instagram, and email marketing 101. Our social media ads manager also spends time with the client to help them learn some advanced Facebook and Instagram ad targeting and placement techniques. During the second four weeks of service we ran Facebook ads, and with this small monthly budget, we were still able to make great progress! Our biggest win came in confirmed member reach and engagement. In just 4 weeks we were able to show confirmed members the CU's content 2150 times and they engaged with this content 1791 times!! With narrow targeting like this, such high numbers are phenomenal in a short time. Now every Financial Institution wants to be engaging existing customers as often as possible. This is especially important as branch traffic continues to decline year over year, and for First Priority they only have two branches, so reaching members online is crucial to staying top-of-mind! During the 4 weeks we managed ads we also sent 282 people to a new checking account landing page, and these were from a member lookalike audience and excluded existing members. That's people who demographically looked like existing members, and chose to leave social media to visit an open a new account page, so this is also pretty impressive! And the average cost to send traffic away from Facebook to the CU website was only $0.94 per click. If you work in marketing you’ll know that this cost per click (CPC) for a new checking account lead is absolutely phenomenal! Overall engagement rates went through the roof during our time of service. 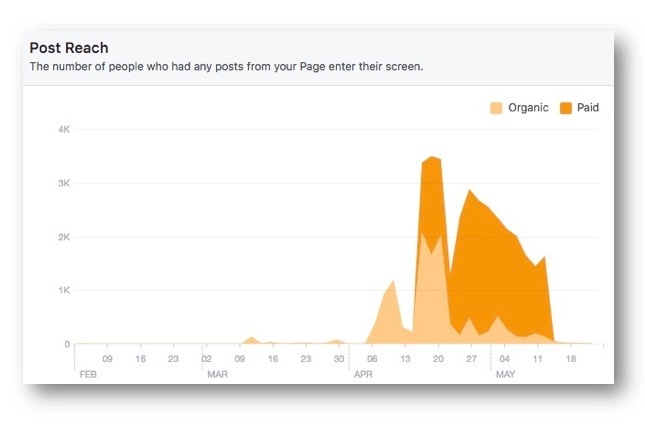 Prior to working with us the CU Facebook page had a 30% engagement rate each week, but we achieved an 136% engagement rate for them with well placed and highly target ads and useful and engaging content!! So during the 8-weeks, not only did the CU’s marketing team receive valuable training and strategy support, but we also set them up with an ads strategy that their small team can maintain on their own in the future. We'd love to work with your team! Contact Us today or visit our pricing page to learn more!